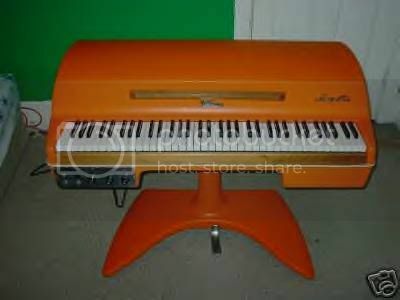 is there a wurlitzer 200A on de left side? and is that a lamp on the honer? yes its pretty dark over there... hey cmon someone else post their baby hahaha. I'm new to this "posting" thing. How do you go about adding an image to your post? 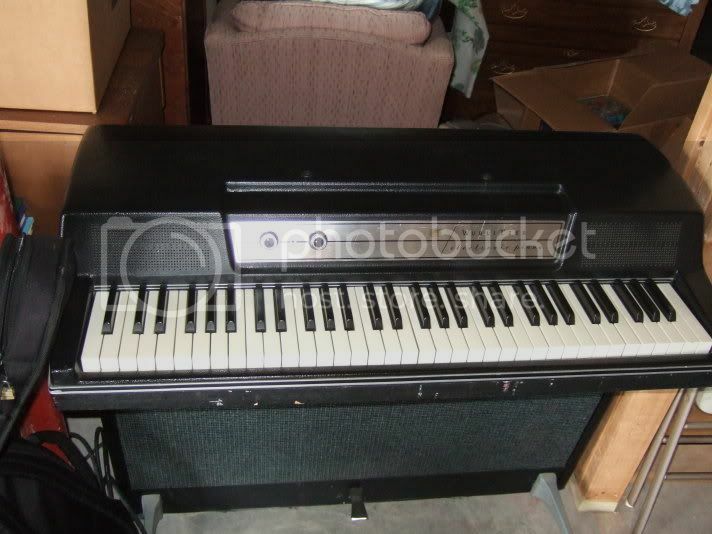 is that hohner pianet T? Well equiped!! what kind of sound it makes? (like rhodes i think, but what are the major differences with these two keyboards?!) i'm interest to get one one day! sign up for an account at www.photobucket.com you can upload pictures from your computer there, its free. For every picture, once uploaded, they give you 3 possible links below it. Highlight and copy/paste the one that starts with [img]. Just paste that line in your posts here and it will link it to the picture you uploaded on the site. There's my 1980(?) 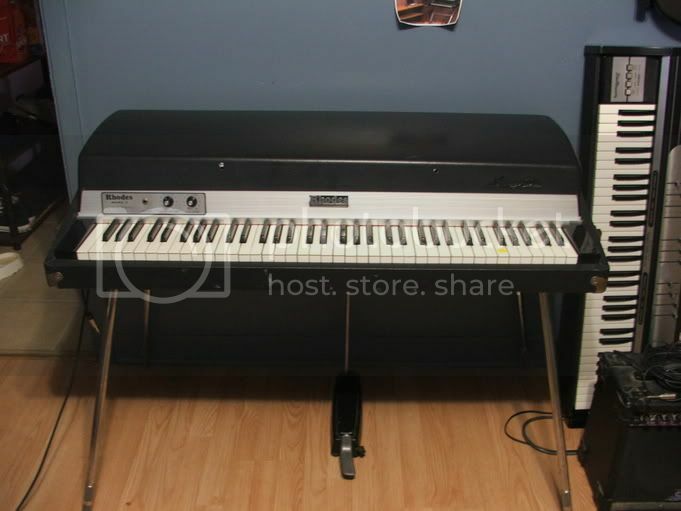 Rhodes Mark 1 Stage Piano(lot of work to do), i paid 200$CAN for it 1 months ago. i'll make restoration inside(tuning, adjust..) then outside (brand news hardware, logos etc..) for now he didn't get the perfect sound, but it'll come!! in 4-5 month i'll post other pictures to show all the work! stage 1976 with a hammond xb-2 on top. got it in good and working condition, only some adjustment and tuning was necessary. maybe i'll make set pickups the pickups in a bit closer during the semester break...but it sounds great already thanks to the yellow channel of my fender hotrod. 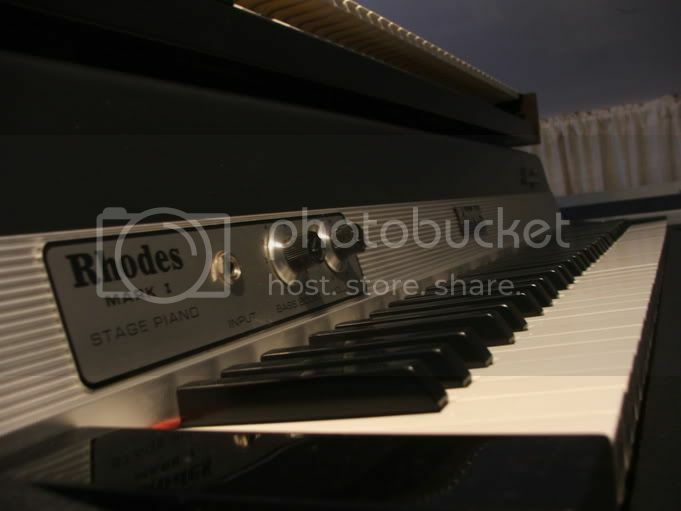 did your rhodes top is a round one? and how many pound is your XB-2 ? 'cause i want to put an other keyboard on the top, but it didn't seems to be really ''tough''! 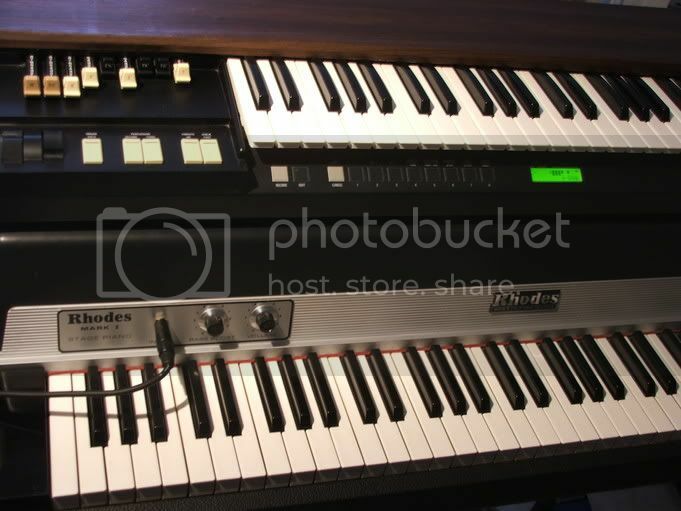 The Rhodes look great! Keep them coming! Here are some crummy pics of my piano. I had better ones but I lost my camera before I could download them. Sometimes, when God opens a window, he slams door. Anyway, this is my new baby, and I can't play it enough. yes, it´s the round top. the xb-2 is about 15kg (30 pounds??) - no problems at all. even my roland rd-150 with 22,5kg (45 pounds??) stays where it should, but i´m a bit anxious if the cover itself survives that. i bought a rubber pad at ikea, which was originally designed for preventing things to move in a drawer. it´s not the stickiest pad on this planet but it helps a bit and protects the cover from scratches. the student rhodes looks great. ha! This is my Mk1 Stage with VK-8 on top The organ's 4 rubber feet straddle the slight bend in the case making it a very solid rig! is that a quik lok double-x steel stand? here comes the funky red tolex again...hey it looks so great, man. incredible. just picked this 1975 Mk-I up a week ago and it's gorgeous. got it locally (yay! no shipping) on craigslist for a great deal. everything looks and works great. ha! nice light in that room. and a nice piano. have fun with it!! 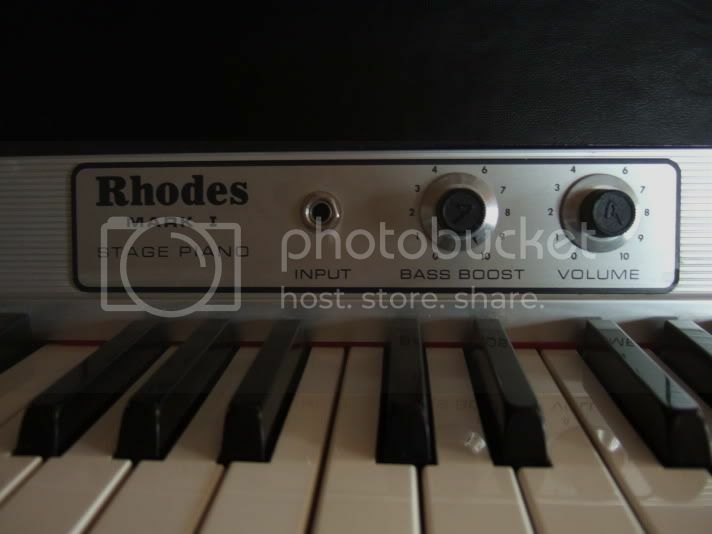 Here is my 1975 Mk1 Rhodes and just for kicks my Whurly to boot. I got this through a friend that was a teacher. 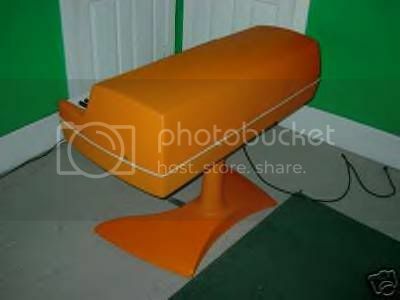 He said that his school had two Rhodes and that he would just give it to me. Crazy huh!!! I got lucky. Although the Rhodes was in good shape inside, I had to add alot of stuff to the outside. It only came with three legs so I had a friend make me a leg for it. I then had to recap two keys because the plastic was gouged off from retarted high school punks. Finally, I had to buy a sustain pedal for it. Now it works 100%. I love the Rhodes....and playing some Funk. nice rhodes and a nice wurlitzer. some day i'll get a clav, a wurly and a real hammond with tonewheels. So, don't beat me, but I bought one of my Stage MkII on a garage sale and payed 100 Euro in 2001... here in germany. The second was an old, not working liverhodes... I think, I will repair it when I have the time for this. Don't you just love the action on those old student models?? 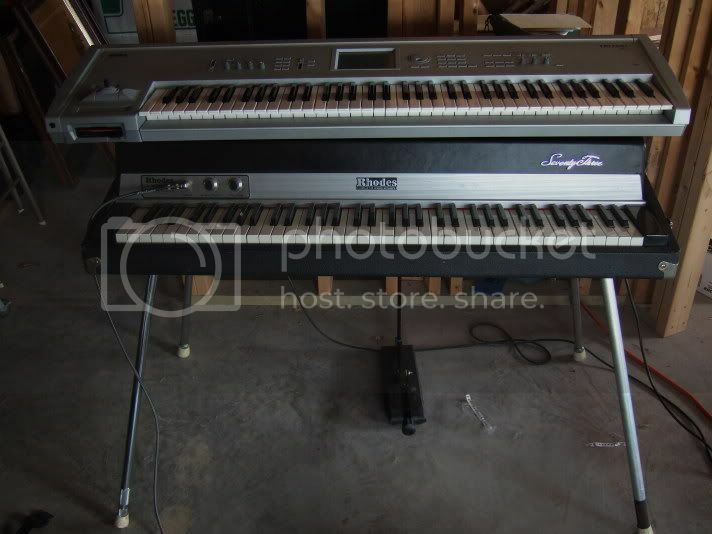 I just sold one that was 1968, so it was after they took out the vibrato (damnit)....but the action is so much nicer on the student models than any other Rhodes or Fender Rhodes I've played. Just simple felt hammers. Sounds great.